Sometimes I think Sing and I stopped growing mentally. I mean, we’re still like 5 year old kids asking ‘Why? !’ – over and over again. And what was bothering us for a really long time was ‘Why Koreans, Chinese and Japanese use different chopsticks?’. Yes, that’s one of the problems in our lives. Or I should say was a problem, because just few weeks ago we found an article mentioning why. 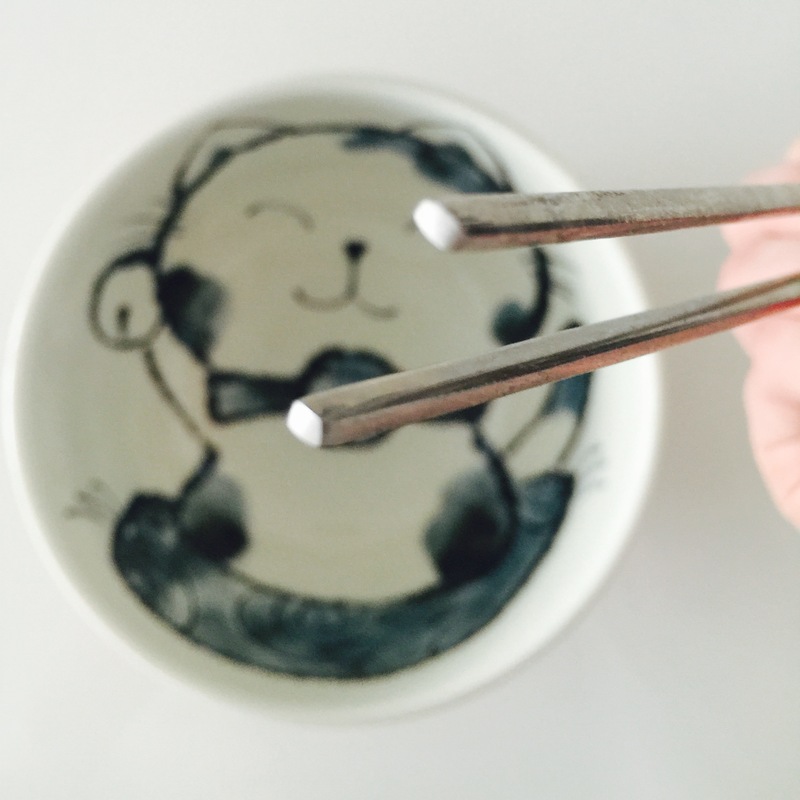 We love chopsticks so much we have 3 most popular types of chopsticks in our home. Actually my husband even said he should have mentioned in our latest video (click here or below to see it!) that chopsticks should be more popular in West. Well, good luck trying to cut a stake with chopsticks. Then, I’ve seen him cutting a pork chop with a spoon so nothing really can shock me in our household. With Sing’s help I translated this the best I could, but if you have any suggestions, please leave them in the comment section! Pictures are by taken me (just saying to show off with a beautiful cat-bowl I got). Chopsticks were invented in China over 5000 years ago. There are poems mentioning them back during Tang Dynasty. Many countries around China also use chopsticks, especially Japan and Korea. Even though they are all called chopsticks, there are differences between the chopsticks in those 3 countries. Chinese chopsticks have round head. 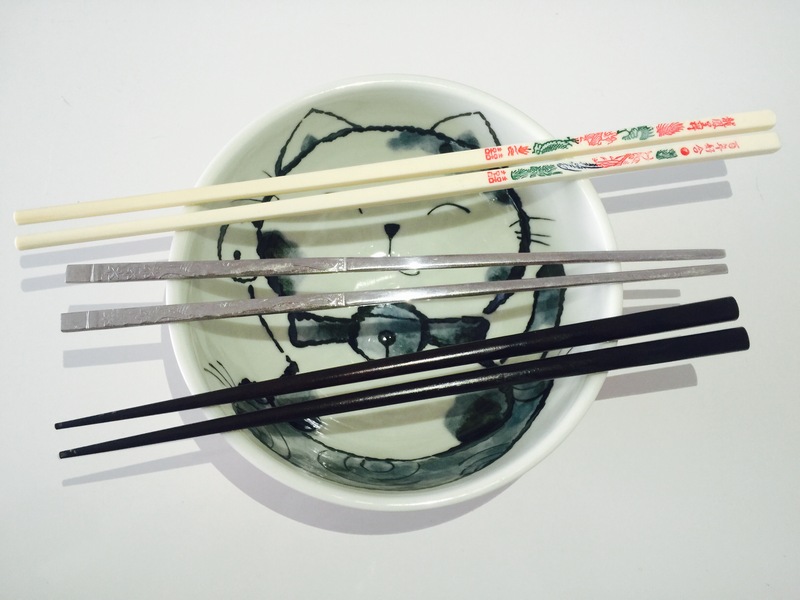 Japanese chopsticks are relatively sharp and Korean chopsticks are made by metal. Chinese chopsticks are the longest among all of them. Chinese people like to enjoy their meal in a group at a round table. Since such tables are usually quite large and there are many dishes on the table, people need a longer chopsticks to reach the food. 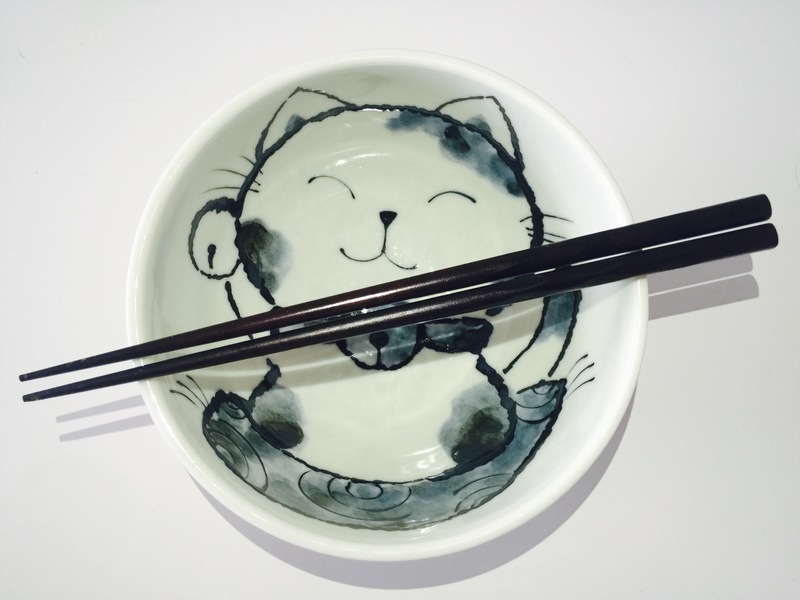 In Chinese culture the host will need to serve the food into visitors’ bowls as a part of the hospitality, therefore it can’t be done with shorter chopsticks. When the Japanese learned to use chopsticks from the Chinese, they modified head of the chopstick to sharp. It is because Japanese food are usually in a set, such as bento or teishoku that does not require a person to reach to the o ther side of the table. Also seafood is very common in Japan, therefore sharper chopsticks can pick up fish easily. Why only Korea uses metal chopsticks? Someone said in the ancient Korea, only the Royal family could afford metal chopsticks. Someone also said metal chopsticks, especially made by silver were used to test whether Kimchi contains anything poisonous. But why Korean chopsticks are very flat? It is because in Korean family, the wife usually serves the meal on a tray to the husband and in-laws first. Flat chopsticks wouldn’t roll off from the tray when it is being carried from the kitchen. Thinner chopsticks can also easily pick up beans and peel off Kimchi. 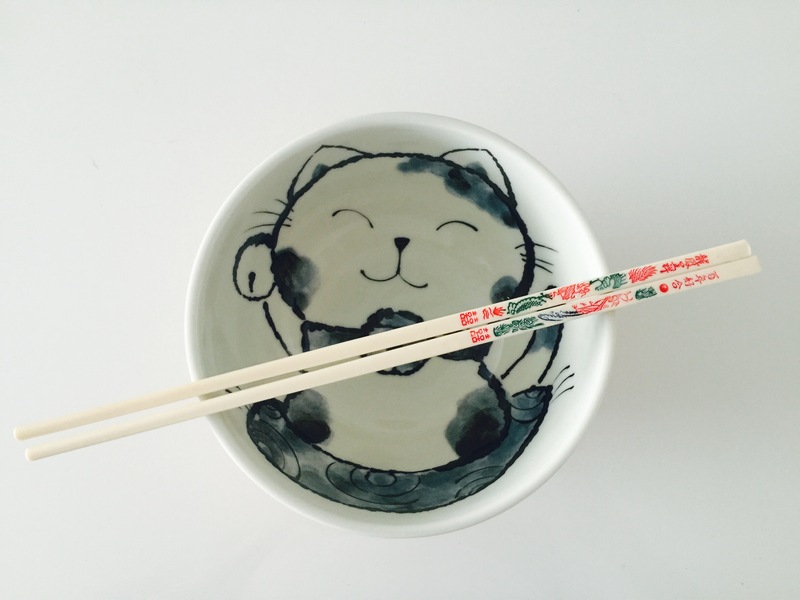 There are many courtesies, rules and taboos in using chopsticks in the Chinese culture. This culture had also been taught to other countries and became a part of the oriental civilization. I personally love Japanese style chopsticks – very easy to hold and operate, sharp at the end so I can grab food easily. 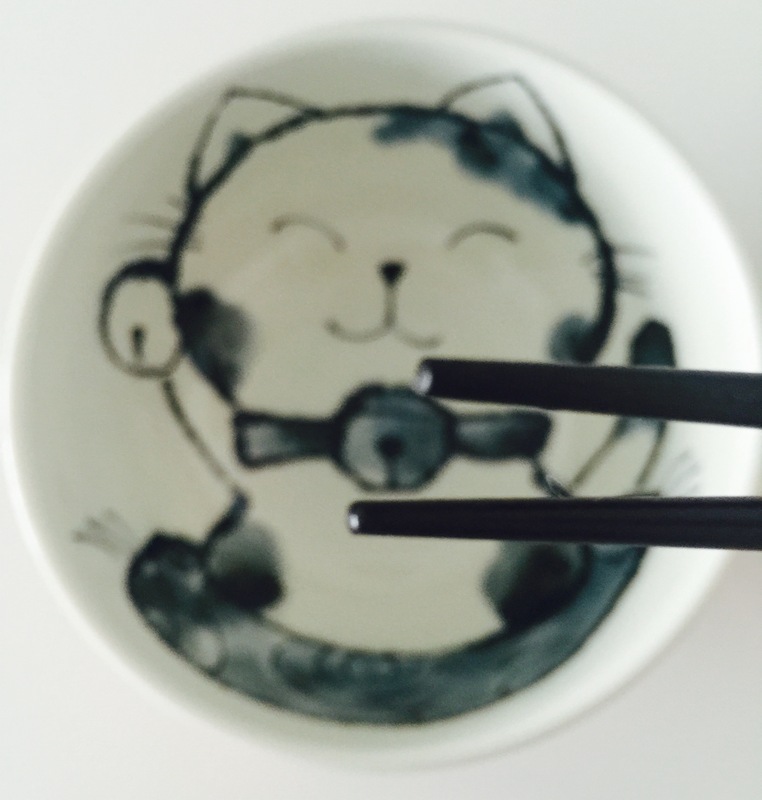 Chinese style chopsticks are OK – after so many years of being married and cooking Cantonese-Shanghainese food for our families I learnt to use them, but I don’t like how wide they are. Korean chopsticks are the worst one – in my opinion only! Don’t get me wrong – I admire each one of you who can use them, because I look like those people in movies when they are suppose to eat some take-away and they cross their chopsticks like scissors and just poke the food. That’s literally me and Korean chopsticks. Funny to watch me doing this, not so funny for me to actually do it. Which one are your favorite? 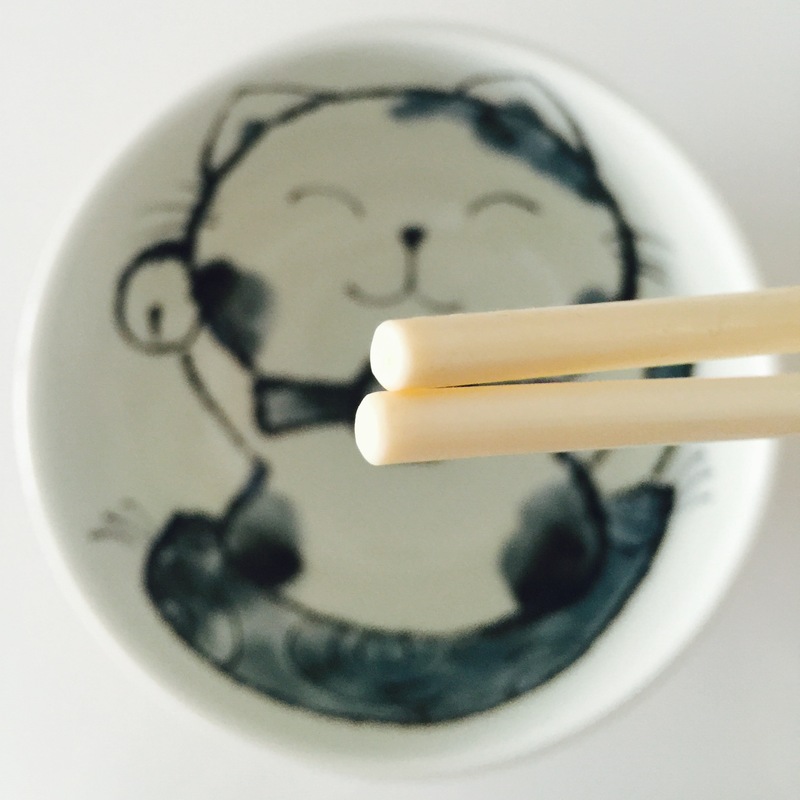 Maybe you know more fun facts about chopsticks? Let us know, we would love to read it! I’m a Chinese and i grew up using the chinese chopstick but have no issues with Japanese or Korean chopsticks though it is more difficult to use Korean chopsticks. That’s a really good and informative summary of the different chopsticks! very interesting even for a Chinese. When i first moved to a village in France, i was trying to get hold of a pair of chopsticks desperately but for many reasons, i took me almost 7 months to get them, i cannot explain the joy of having them again and thought to myself why didnt i pack some pairs of chopsticks when i moved!! I also had issues seeing how people in the West not understand how to rest their chopsticks when not using them. Then i realised how deeply ingrained our parents have taught us about using chopsticks, i cringed when i always see how they are misplaced but i try to not to comment too much. Not everyone likes to receive comments. Pretty cool post — I never even knew there were differences! Probably because all restaurants here in the U.S. use the same disposable wooden chopsticks. Even the sushi restaurants are no different from dim sum. Although possibly I’m just not observant enough to tell the difference. Awkward fact, since moving to China 4 years ago I only tend to use chopsticks. I have more chopsticks that western utensils. I even eat salad with a fork. They use metal chopsticks in China though. Especially at schools. Hit up universities and there are some restaurants that have them. They sell them in stores too. I think that be a bad idea because i/ we might get the result that they are really Related! I heard that the Japanese sharpened their chopsticks several centuries ago to stay armed even while eating – as law required to leave the actual weapon outside and away from the table. OH wow, now that’s a cool story! I can use all of them now but at first I did think the Korean ones were especially difficult to handle. Also because they are very heavy! As someone mentioned above I have also seen metallic chopsticks in China, but they are round and possibly hollow as they are not too heavy. So still easier than the Korean ones. When I first traveled and came to Korea, I was frustrated by Korean chopsticks. I had gotten so used to the Japanese chopsticks, but even those, I wasn’t able to hold properly. Japanese people would sometimes point it out to me, but I couldn’t break the bad habit of holding them together (and not one in the crook of my thumb, like you’re supposed to do). But Koreans don’t ever comment on my chopsticks skills. I’ve gotten used to the metal ones, and in our house, we have round and flat ones. I find that they are good for different things. I can’t eat noodles with the round ones, for example. I actually wrote a research paper in Japanese for one of my classes when I was studying abroad. It was about the history of chopsticks in different countries and why they were different. I should go back and look at it and see if my Japanese reading skills are still up to par! Thanks for the interesting post! I have noticed the difference in chopsticks as well, but never knew the reason behind it. I have mostly used Chinese chopsticks, but I haven’t noticed any big difference when using Japanese chopsticks. Metal chop sticks are defiantly the hardest to grasp with as they are so slippery! I like Japanese Chopsticks the most. Thanks for the article! 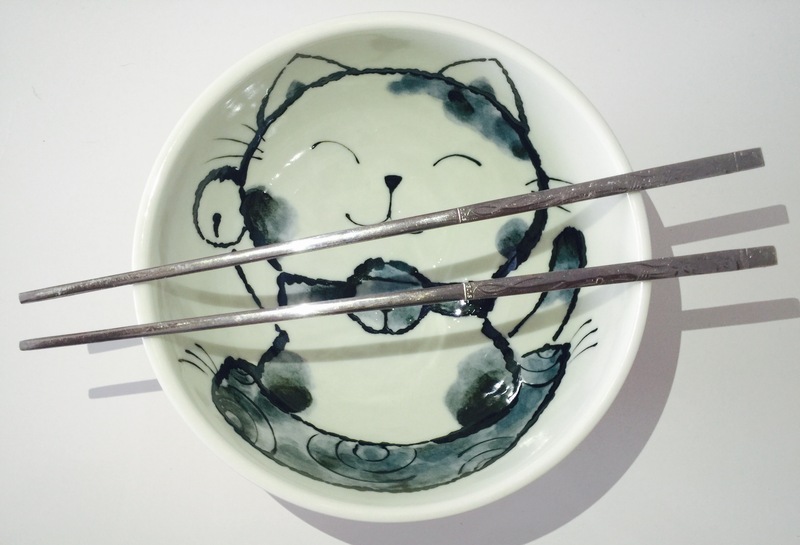 Btw, where did you get this cute cat bowl? I actually prefer the Korean style, probably because I have most experience using them. They also feel smaller and more delicate in the mouth, which I like (easier to get more food into the mouth too!). I could use the round Chinese chopsticks and the wooden ones before I moved to Korea, but afterwards I can’t seem to get the hang of the Chinese ones again. They just feel so big and clumsy to me – it’s embarrassing because I used to be better at them! I like real wooden chopsticks..the surface grips the food better. That’s what I buy prs.of 8 or whatever for home use. Sure if they are pointed, fine. But not critical. I’ve been lectured by my mother to make not to eat off dark wood treated chopsticks. Just straightforward wood. Interesting post. And, thanks for the information. I was also always curious about the reason Koreans use metallic chopsticks. I just thought this substance doesn’t easily get dyed red or brown nor absorb the sour and pungent smell like wood and plastic. That would make sense as well! i have to agree with you. korean ones are the least comfortable to use. i much prefer japanese ones, as the sharper ends are best to pick up individual grain of rice if needed. i actually collect many wooden japanese chopsticks. “To test whether Kimchi contains anything poisonous.” WTF?! You think everything in Korea revolved(s) around kimchi? That is the most ridiculous thing I ever read. Anyway, it is true during the three-kingdom period in Korea, the rich/aristocrats used silverware to show off their status, whereas poorer peasants/commoners used other metals to imitate them. Its flatheads are designed so that they can pick up beans, peas and leaves (like perilla) easier. I personally can use all of them quite easily (may be because I can use Korean ones well, the most difficult one lol) – however the Chinese ones are a bit too long for me.